This beef fry is a flavorful, eye-catching entry. If I had to nominate a favourite beef recipe, this might be it. 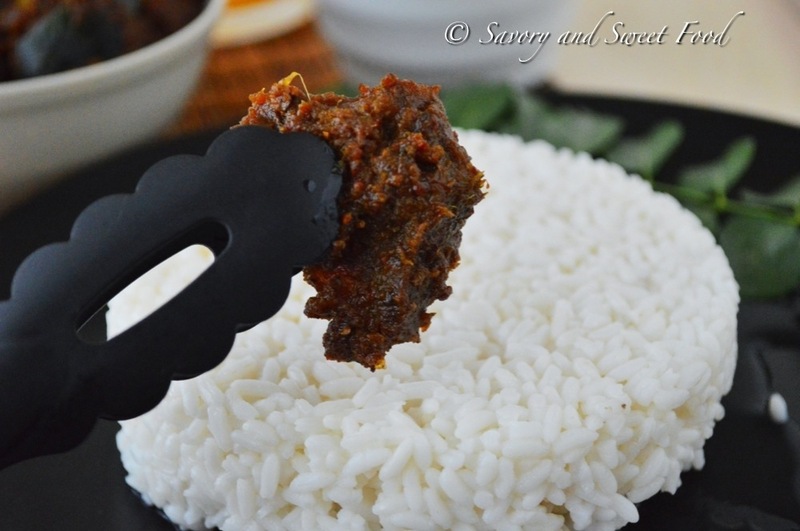 Today i am going to share with you the recipe of a simple beef fry, a dish that uses minimal ingredients and very less time to prepare. If you have a pressure cooker and a frying pan, it can go from fridge to plate within 30 minutes. While cooking the beef, no water or stock is used. The beef cooks in its own juices and the onions. 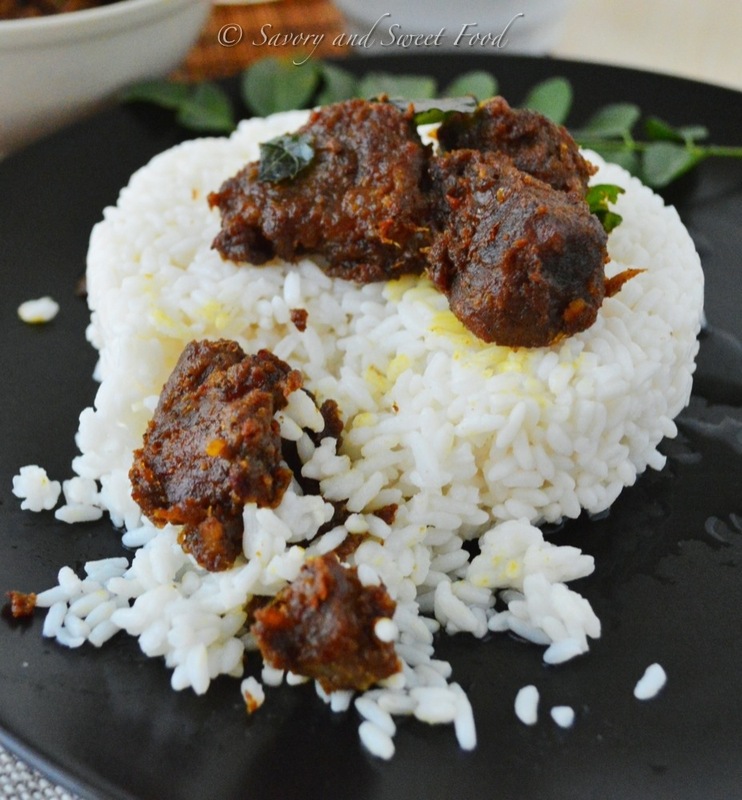 This dish is a common one among south Indians. Just discovered this two weeks back, and i already made it thrice. Soo addictive! 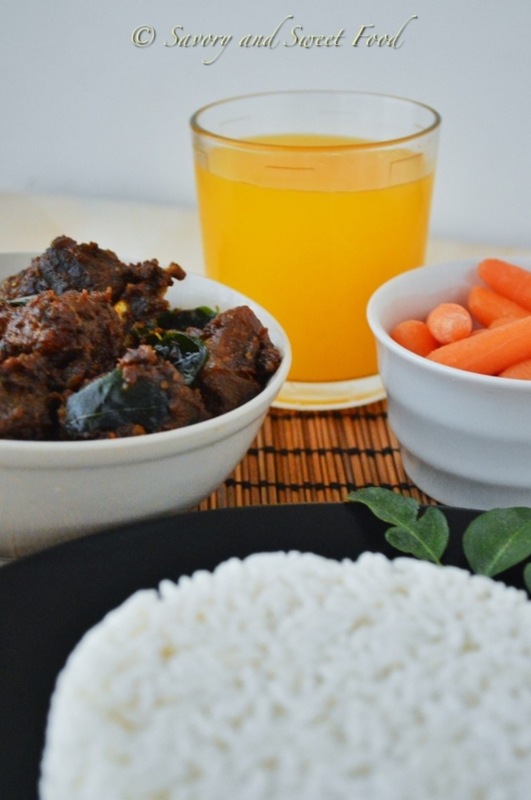 You get this nice authentic aroma and flavor from this dish, which is mainly imparted by the coconut oil. 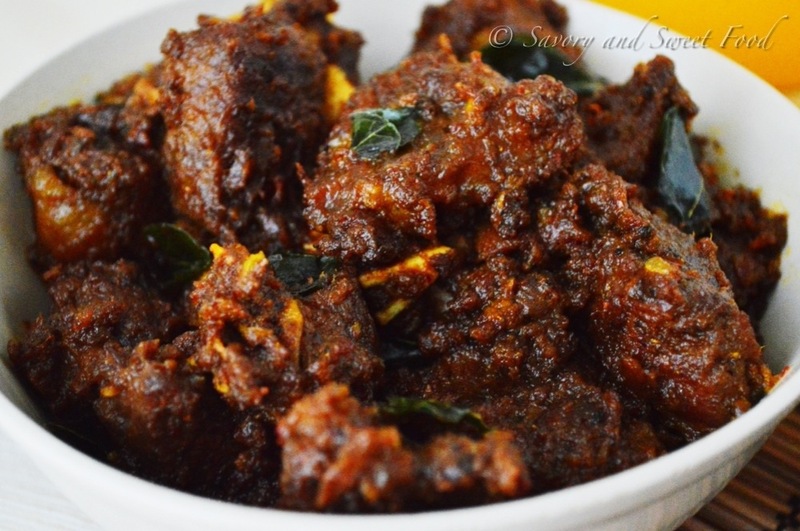 It can be eaten with porota, rice, bread, appam just anything. Im not explaining anymore further. You guys make this and tell me about it. 1.Marinate the cleaned beef pieces with the ingredients listed under marination. Keep it aside for 15-20 mins. 2. Add 2 tbsp of water to this & pressure cook till the beef is done(the cooking time of beef depends on the type of beef used). Keep the cooker closed for 20-25 mins. 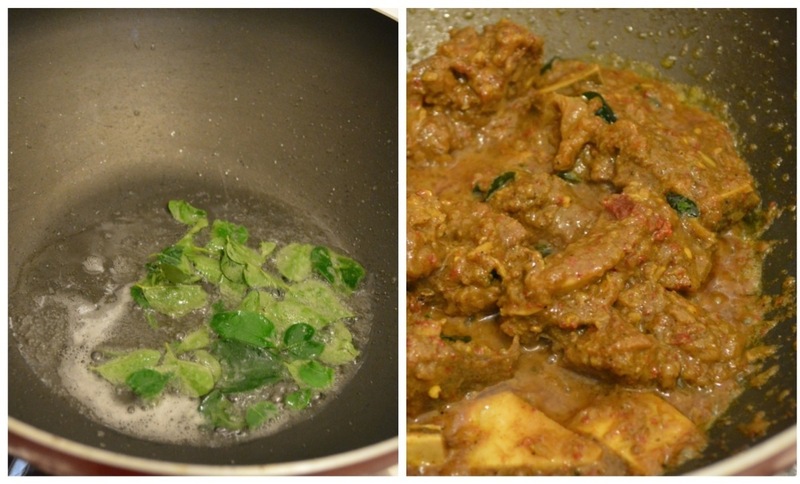 Open the cooker & if there is any excess water in the beef, cook till the water is dried completely. 3. Heat oil in a heavy bottom pan & add tons of curry leaves. Fry it for few seconds. Add the cooked beef. Give it a good stir. Cook on low flame till the beef becomes black in colour. If the beef appears to dry in between, add a little oil & continue cooking. It will take around 10-15 mins. ✔Use crushed red chilly itself instead of chilly powder. ✔Don’t substitute shallots with regular red onions, it will affect the taste. Marinate the cleaned beef pieces with the ingredients listed under marination. Keep it aside for 15-20 mins. 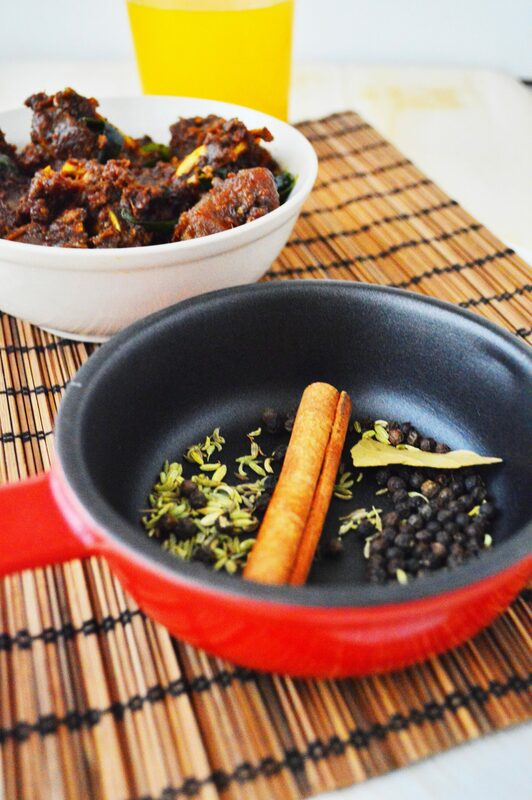 Heat oil in a heavy bottom pan & add tons of curry leaves. Fry it for few seconds. Add the cooked beef. Give it a good stir. Cook on low flame till the beef becomes black in colour. If the beef appears to dry in between, add a little oil & continue cooking. It will take around 10-15 mins. I’m not sure whether u would remember me. I’m Soniya’s cousin. I have been following your blog for a while now, around the time u posted Serradura. I have always wanted to make it since i saw Sunita Rao making it on some food channel. Finally your post inspired me to make it for a get-together that Sony also attended. Everyone looved it. 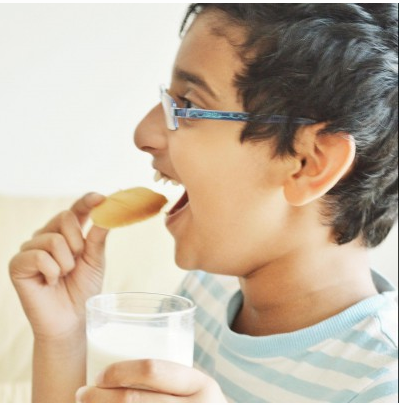 It was simple, easy and not to sweet, yet supreme in its taste …. Last night i made this Beef dish, n my family loved it though it was a bit too spicy for the kids. 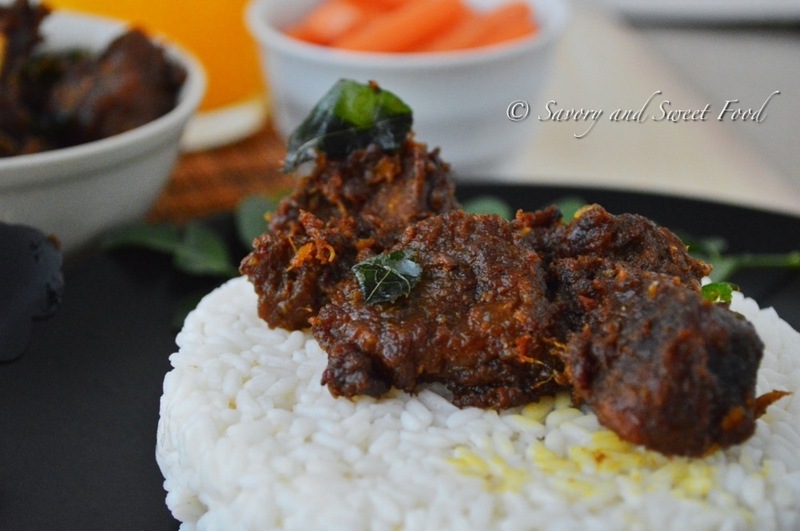 GREAT RECIPES N AWESOME PICS TO GO WITH IT…. Looking forward to more yummmmy recipes…. Walaikumsalaam sunithatha! Yes i do remember you well. 🙂 Sonia talks abt you. Thankyou soo much for following my blog. I really feel happy to know that people are trying out dishes from my blog. Thankyou for that. Actually serradura was Sonia’s suggestion. I did’nt have a clue abt that dessert until i had it from her house. 🙂 so glad that you liked the beef fry also. Btw all my savory recipes would be a little bit spicy because thats how we like it here. Always adjust the spicyness according to your wish. And btw please do send me the pictures of anything you make from the blog. I would love to see it and post in my blog. Glad to know that you do remember me. Being from a foodie family, I have always been one myself and have enjoyed trying out new dishes. With various food blogs and Youtube videos, finding a new recipe has become an easy task these days. And I have been thinking of starting a blog myself for quite some time now. Insha Allah, may be one day soon…. Next time I try out any of your recipes, I shall sent you a pic, Insha Allah. Thanks for the tip on adjusting the spiciness. Thats true, food and cooking have become a trending thing now. Its good anyways. Thank you soo much Shelja. Really happy to know that you liked the beef fry. And thanks for following my blog. I tried this recipe. First time I was making beef and it was a huge success. Everyone loved it.